This year’s draft County Council budget represents an important victory for one of the county’s top priorities: supporting the Purple Line. While the Purple Line is a State-funded project also seeking federal funding, the County has an important role to play in making it happen. The County’s 1988 acquisition of a train-track right-of-way between Bethesda and Silver Spring was a vital contribution to the Purple Line’s alignment. In addition, the County has committed to build a new entrance for the Purple Line at the Bethesda Metro Station as well as completing the Capital Crescent Trail and Silver Spring Green Trail alongside the rail route.orized funds for its design. The expectation is that if federal construction funds are approved on a timely basis, then ground will be broken in 3 years. The new Bethesda entrance is an important project on its own merits because of the frequent escalator breakdowns at that station. Those breakdowns cause intolerable conditions for Metro users and it’s unclear when WMATA can fully remedy them. In the short term, I have worked with my colleagues to call on WMATA to improve its communication with passengers and to provide better transportation alternatives when the escalators fail. In the long run, a new entrance will be very helpful. The new entrance is also an integral part of the Purple Line project. One of the virtues of the Purple Line is its ability to link both ends of Metro’s Red Line (as well as the Orange Line in New Carrollton and the Green Line in College Park). In Bethesda, a seamless transfer requires new station capacity. In the last capital budget, the Council programmed $53.7 million in construction money to build it. This was a strong signal to both the federal and State governments that Montgomery County was committed to the Purple Line and was willing to put its own money down to get it, just as the State is doing with planning funds. To my surprise and dismay, in his recommended capital improvements program the County Executive Leggett recommended delaying all construction money for the new entrance to Fiscal Year 2019 or later. The Executive told the Council that since the federal government had not yet approved construction funds for the Purple Line, the County should budget no money for related projects. Furthermore, he argued that the County’s commitment of money for the Bethesda entrance would have no bearing on whether the state and federal governments would fund the Purple Line. The County Council unanimously disagreed. 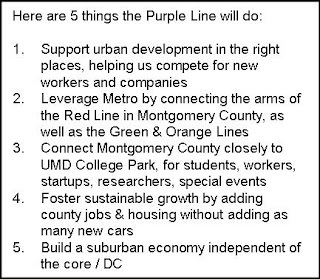 We want the Purple Line. It is an important investment in the future of our economy and our community. And we believe that withdrawing funding would send a signal to our partners in Washington and Annapolis that we will accept delay for the project. So every member of the Council voted to put the south entrance construction money back in the budget. See below for a great video that showcases what the Purple Line will do. A related project is the Capital Crescent Trail. The State and County both recognize that a completed, paved pedestrian and bicycle trail between Bethesda and Silver Spring is a necessary complement to the Purple Line. Prior to this year, no Executive or Council had ever included funding for the trail. This year, the Executive did not recommend paying for it. But the Council unanimously voted to approve $49.5 million to build the trail. The project will be a largely 12-foot-wide hard-surface hiker-biker path with connecting paths, a new bridge over Connecticut Avenue, a new underpass beneath Jones Mill Road, supplemental landscaping, and lighting at trail junctions, in underpasses, and at other critical points. The County is still exploring how to cross the trail at or under Wisconsin Avenue, and we are not giving up on a tunnel. 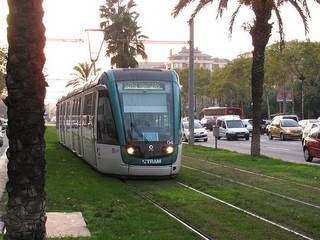 The trail is scheduled to begin construction in Fiscal Year 2016, again the same tentative date as the Purple Line. Another related project is the Silver Spring Green Trail, an 8-10-foot-wide path that will run along the north side of Wayne Avenue between downtown Silver Spring and Sligo Creek Park, and in the same right-of-way as the Purple Line. For this project, the Executive also recommended delaying funds to Fiscal Year 2019 or later, but the Council has restored its funding to the Fiscal Year 2016-2018 time-frame, consistent with the Purple Line’s current schedule. Ultimately, the Purple Line’s fate depends on whether federal and State funding will be available. But the County Council has taken a stand that the County will do everything in its power to make sure that the Purple Line – and the Capital Crescent and Silver Spring Green Trails – will be built. You have my commitment that I will push to make them a reality.